Experts agree that olive oil should be stored in a cool dark place. 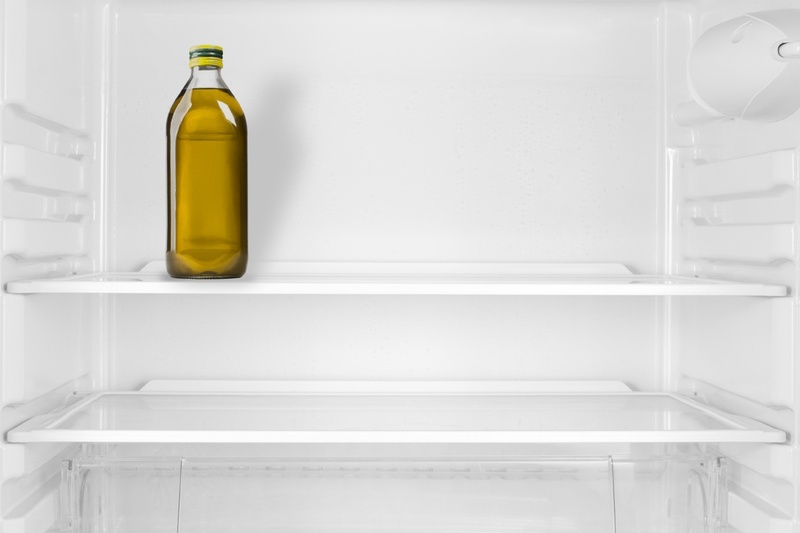 Does that mean you should store olive oil in the refrigerator? Olive oil changes when stored in the refrigerator. Olive oil will form crystals and start to solidify when subjected to cold temperatures. Once the olive oil is brought back to room temperature the oil will return to its liquid state. Some research suggests that repeated heating and cooling – such as storing it in the fridge in between uses – puts stress on the oil and doesn’t necessarily extend the shelf life. Furthermore, it is an inconvenience to bring the olive oil back to room temperature in order to use it. Storing your olive oil in a cool dark cupboard or pantry is the way to go. Make sure that your olive oil is also tightly capped and that you buy olive oil in bottles that you will use within a few months of opening. Note: Some people believe that you can use the refrigerator to test for olive oil authenticity. This is 100% false. There is no reliable home test to check for olive oil authenticity. If you are looking for assurance that the olive oil you buy meets global olive oil quality and purity standards, look for the NAOOA quality seal. A list of brands that carry the seal can be found on the NAOOA website.